The downfall of a leader who has the arrogance to believe his views are the wishes of God and so rules against the will of his people: now there’s a cautionary tale for our times. Sophocles’s tragedy may be 2,500 years old, but there is much timely relevance to mine here in the National’s new production of Antigone. The third of the Theban plays is about as pitch as tragedy gets. Creon succeeds to the throne on the death of his two nephews, who die fighting each other for the succession. In his role as newly appointed leader, Creon decrees that the brother who died defending his country will receive a proper burial, and the other will not. Furthermore, anyone who attempts to bury the disgraced brother will face death. Step up Antigone, sister to the two brothers. The horror of the piece is further impounded by the familial history entangling the characters. Antigone and her siblings are the offspring of Oedipus and his mother Jocasta, while Creon is the brother of Jocasta and therefore Antigone’s Uncle. Antigone happens to be romantically involved with her cousin Haemon, Creon’s son. Director Polly Findlay sets the play in a concrete military bunker in what could be the 1970s. As the action unfolds, a tableau is struck – a group of leaders captured as they watch two men killed on a screen. It is a near exact recreation of that Osama bin Laden photograph, complete with a blonde-bobbed Zoe Aldrich as Creon’s wife Eurydice, temporarily evoking Secretary of State Clinton, in the much-discussed hands-over-her-mouth pose. It’s a bold opener, and the modern day references continue. The large state portrait hanging over the scene evokes an American President, maybe George W Bush. The madness, the delusion, the destruction and the killing could refer to any number of modern day leaders from Mugabe to Assad. But surely the finger points most deliberately towards Tony Blair. The man accused of eroding a democracy, of reducing a cabinet where he was ‘first amongst equals’ to the point where it became almost a dictatorship. As Creon stands in the final scenes, covered in the blood of his niece, son and wife, whose deaths are directly attributed to his decree and unmoveable belief that he alone is right, one cannot help but think of Blair, the bloodshed in Iraq, and even David Kelly and 7/7. Much has been made of Blair’s conversion to Catholicism and his admission that he turned to God when deciding whether or not to send troops into Iraq. Here Creon similarly quotes God in his decision to condemn Antigone. And the Blair parallels resonate throughout Don Taylor’s text; there is much talk of the state, of terror and terrorism here, and of two dead young men – one who can be buried honourably as a soldier who patriotically died fighting for his country, the other a traitor who attacked his own people. 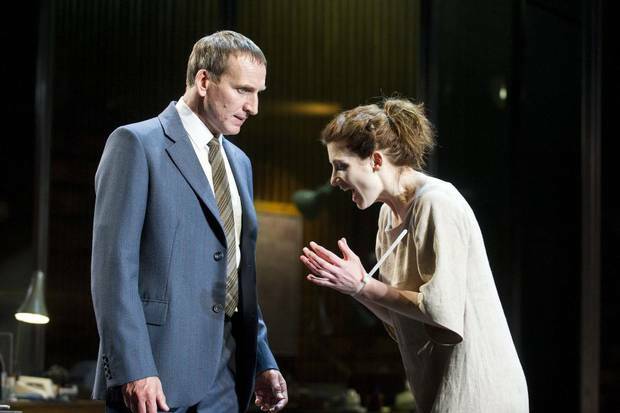 Christopher Eccleston is supremely, unremittingly evil as the deluded despot Creon. Surrounded by a chorus of yes men, he commands the stage with ferocious energy – his body and speech acting in opposition to each other to create a lively, jangling realism. Jodie Whittaker shines, but never quite tugs at the heartstrings, as the solid, determined martyr Antigone, and Luke Newberry turns in a convincing, impassioned performance as her lover, and son of Creon, Haemon. But ultimately, the modern-day conceit never quite comes off. The actors and the action are somehow confined by the millennia old format: the long monologues, interspersed with the chorus responses; the one set; the bloodshed taking place off stage. It all adds up to leave the actors caged and restricted, so that the piece never fully comes to life, but remains flat and two dimensional. Eccelston’s brilliant, nuanced delivery of the language manages to transcend, and his performance is worth the ticket price alone, but he is the only actor to really successfully do this. The unwillingness to root the play decisively in any one decade, era, country or regime, leaves the audience dangling; the modern-day parallels hinted at, but never quite confirmed. When Creon announces that Antigone will be buried alive, the Blair analogy is shattered, and suddenly we are transported to Saudi Arabia perhaps, where women are still stoned to death. Eccleston and Whittaker’s Northern accents befuddle things further. It’s all a bit confusing and unsatisfying. A full modern-day update is never fully realised, as the play is still centred on the Greek belief system. Antigone is willing to go to her death to secure a holy burial for her brother. When Tiresias, the blind prophet, tells Creon of his visions and prophecies, such is the Greek belief in the power of the Gods to damn for all time, that Creon quickly performs an about-turn. Central tenets such as this are never fully integrated into the setting and thus constantly return to jar and alienate this modern proposal.